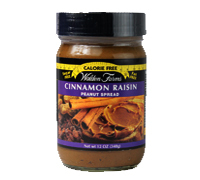 Smooth and creamy Walden Farms Cinnamon Raisin Peanut Spread is made with natural fresh roasted peanut flavor. Delicious on crackers or toast. Switch & save over 500 calories when you make a healthy PB&J with your favorite Walden Farms Calorie Free Fruit Spread. Save hundreds of calories every day "The Walden Way." Calories, fat, carbs, gluten, sugars, preservatives, dairy, egg, wheat.